PCE Instruments' accurate, affordable coating thickness gauge, thickness meter, surface testing and film gauge devices are used for material testing, manufacturing quality control and automotive paint inspection applications. 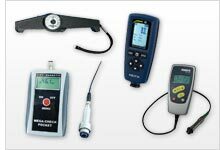 Choose from a variety of coating thickness gauge, mil gage or paint meter products used for the non-destructive measurement of nonmagnetic coating, insulating layer and dry film thickness (DFT) on ferrous and / or non-ferrous metal substrates such as steel and aluminum. A coating thickness gauge is an essential quality assurance tool when anodizing, galvanizing and applying zinc coating to metallic surfaces. A coating thickness gauge also is used to measure body paint thickness and uniformity on pre-owned cars, revealing repainted spots, identifying hidden damages and exposing undisclosed accidents. This information is important when determining the actual value of a used car. In addition, certain types of thickness gauges can measure wall thickness and determine the hardness of metals, plastics and glass. What is coating thickness measurement? 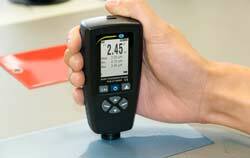 Coating thickness measurement is the determination of the layer depth of a coating or film on a particular substrate. Coating thickness can be measured when the film is wet or dry. However, non-destructive coating thickness measurement must be performed when the film or coating is dry. The substrate is typically a ferrous metal (e.g., steel or iron) or a non-ferrous metal (e.g., aluminum or copper). In some cases, coating thickness must be measured on non-metal substrates such as wood, glass or plastic. In these instances, an ultrasonic coating thickness gauge is recommended, as a traditional dry film coating thickness gauge uses a magnetic or eddy current measuring technique. Most eddy current or magnetic coating thickness gauge products are dual purpose, meaning the gauges are suitable for measuring coating thickness on both ferrous metals and non-ferrous metals. These versatile coating thickness meter devices usually offer a wide measuring range. Where is a coating thickness measuring device used? Coating thickness measurement is performed frequently in the automotive industry. During automobile manufacturing and production, a coating thickness gauge is used to determine whether enough paint or gloss has been applied to various parts and surfaces. Car dealerships, auto body repair shops and car insurance claims investigators also use coating thickness meter devices to identify variations in vehicle paint jobs signaling prior accidents. 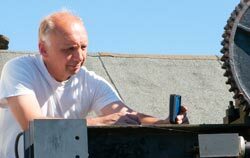 In addition, a coating thickness measuring instrument can be used to inspect the application and wear of corrosion-resistant protective coatings on metals (e.g., hot-dipped galvanized zinc on steel beams). Thus, a handheld coating or layer thickness meter is a valuable tool used by building, bridge, oil tanker, gas pipeline and petrochemical plant inspectors for corrosion monitoring. If you have questions regarding a specific application, the friendly and knowledgeable technical support staff at PCE Instruments will assist you in finding the right coating thickness gauge for the task at hand. Simply contact or +44 (0) 2380 987 035 for PCE Instruments UK, or or +1 (561) 320-9162 for PCE Americas Inc.
Is a built-in sensor or an external sensor probe required? The sensor of a coating thickness measuring device either can be found inside the unit or within a separate probe. A coating thickness gauge with a built-in or internal sensor is ideal for quick, on-the-spot measurements in the field or on the production floor. This style of coating thickness gauge often comes pocket-sized or designed to be conveniently portable. A coating thickness gauge with an external sensor probe is better for taking measurements in small spaces with limited access. Are data storage and transfer necessary? Some coating thickness gauge devices come with memory for saving measurement data. When the memory is internal or built into device, the saved measurement data usually can be transferred to a computer via a USB port or RS-232 interface. In addition to a connection cable, software may be required for data transfer. Please review the specifications of each coating thickness meter carefully before buying to ensure all necessary components are purchased. How much do you value customer service and technical support? This is another important point to keep in mind. Find out how long the supplier has been in business. The longer the company's tenure, the more likely it is that you will be able to order spare parts a few years down the road after buying your coating thickness gauge. PCE Instruments has been in business since 1999. (For more details, please visit the About Us / Corporate History section of our website.) Also find out what kind of technical support will be available to you. Call PCE Instruments, talk to the technical support team prior to purchasing and see for yourself the level of service provided. Often more is involved in the budget than just the cost of the coating thickness meter. 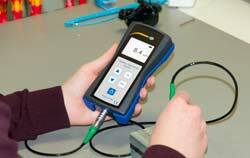 Calibration costs are common expenses that can occur when using a coating thickness measuring device. For instance, if you need to meet the requirements of an ISO quality standard, a regular calibration interval needs to be adhered to. ISO calibration costs can occur at the time of purchase and reoccur on an annual or even semi-annual basis, depending on your accuracy needs and usage of the coating thickness gauge. It is also possible that recalibration becomes necessary later on, due to the drift sensors can experience over time. Consumables like (rechargeable) batteries should be included in your calculations as well. The majority of products and devices used in everyday life all possess a type of coating on the surface, for a number of reasons: it may be an optical improvement of the looks, it may be an improvement of the smoothness (or vice versa) or other qualities, or a protective function. Coatings are not the same and they differ not only in the type of material / paint / varnish, but also in the thickness which can be measured by a coating thickness gauge. Nowadays, the coatings may be only a few nanometers thick, as well as on the contrary, very thick, that is why the necessity to be able to measure the thickness of the film on the surface has become so acute and this is where a coating thickness gauge comes into play. Thin coatings have found a wide application in many industrial sectors (textile, medical pharmaceutical, chemical, marine, oil, gas, production and packaging and many others). In spite of the thickness, such Nano-coatings are capable of significantly improving the quality, durability and resistance of the basic material, and thus, of the whole product. The producers opt for thin nanocoating, since it provides additional protection against corrosive and similar negative influences, bad weather and changeable ambient conditions, heat / water / ice, reduces friction and thus, wear-out, possesses anti-bacterial function, protects against EMF. Thin coatings are applied in the mirrors production, so that the glass could reflect instead of being transparent. Thermal spray thin coatings are often applied with a protective purpose even on the surface of constructions, buildings, planes. Depending on the substrate the coatings may be absolutely different: metallic, oxide, inorganic, non-conductive, applied by thermal spraying etc. Type of coating is selected based on the properties of the substrate material. For example, in medical sphere, experiments with Chrome-Nitride have been carried out. One of the coatings applied in the past was electroplated chromium (VI), but nowadays its application is reduced with the possibility of being stopped. Surfaces requiring protection, smoothness and robustness get metal oxidic film, as well as alloys; besides, rhodium, copper and even base on gold or silver. Glass substrate often gets a variety of optical reflective and non-reflective coatings, depending on the application task. Some coatings provide a high-level infrared protection with an absolute transparency. Innovative technologies introduce silicon coatings, which are suitable for application on objects of different shapes. Besides metal, plastics / polymers, ceramics, textile fabrics can be taken as substrate. While thin coatings are gaining more and more popularity among the producers, there is a demand for thick coatings, which sometimes reach the thickness of 50 and even 60 mm, measurable with a PCE coating thickness gauge. Such coatings are required for a protection of metal (iron) and non-ferrous metal surfaces from extreme external influence, like fire, water, shocks etc. It’s most suited for ships, pipelines and for those environments where an object / device is exposed to extreme temperatures. The main task of a thick coating is to reduce the interaction of the main substance with the outer factors and diminish the risk of friction, wear-out or damage. 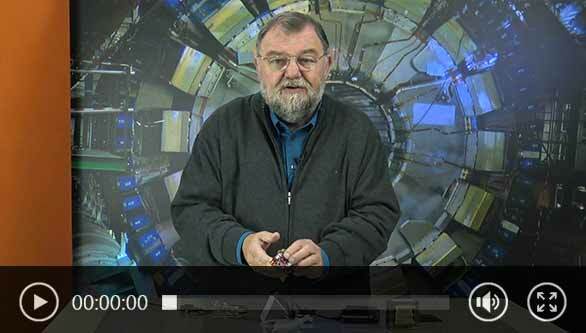 A coating thickness gauge can help assess if this requirement has been fulfilled or not. For the pipelines protection against corrosion is very important and thus thick coatings are recommended (polypropylene). Thick coating often consists of a few layers, applied by depositing certain paste / solution / mixture and then drying, while thin coating is applied by other methods (for example, sputtering). The right coating thickness gauge must be carefully chosen here. Galvanized zinc coating is another example of thick coating applied on steel, though there are a few problems connected with firmness and optical look then. To achieve better results, galvanizing is supported by painting. Coating type and methods of application requirements are defined in ISO standards and the measurements should be carried out in compliance with the existing regulations. Modern technology, besides destructive methods, allows NDT method application for thickness measurement with a variety of thickness gauges available (ultrasonic gauge, electronic magnetic coating thickness gauge, eddy current gauge etc. ).